The 27.96 metre motor yacht Najati, listed for sale by Steen Christensen at Camper & Nicholsons, has been sold with the buyer introduced by Riva UK. Built in GRP by Italian yard Pershing to a design by Fulvio De Simoni, she was delivered in 2013 as a Pershing 92 model. 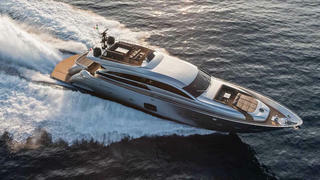 Based on the very popular Pershing 88 series, she offers far more flexible space in the saloon. Accommodation is for 10 guests in four cabins consisting of a master suite, VIP suite and two twins with Pullman berths. All cabins have entertainment centres, Samsung television screens and en suite bathroom facilities. The open plan saloon has large windows offering 270 degree panoramic views, comfortable seating, a dinette seating eight guests and three helm chairs forward while an entertainment centre includes a Dometic server offering on demand video and audio throughout. A unique feature is aft doors that can be recessed into the superstructure, so that the saloon becomes an extension of the aft deck, full of daylight and fresh air. The aft deck has built in seating, a table and sun pads with stairs leading down to the toy garage. The tender and jet ski in the aft garage can be launched with minimal effort and the oversized bathing platform offers the ideal sunbathing area close to the water. Up on the flybridge is a lounging area converting to sun beds and protected from the sun by a Bimini top on carbon fibre poles. More sunbathing is available on the foredeck with a built in table and sun pads. Twin 2,639hp MTU diesel engines give her a cruising speed of 38 knots topping out at 41 knots. Lying in Spain, Najati was asking €5.1 million.